Last updated: Apr 7, 2019. 11:51 UTC. Looking for Namecheap promo codes and coupons? #MasterTheWeb and save money today with our exclusive The Webmaster offers. 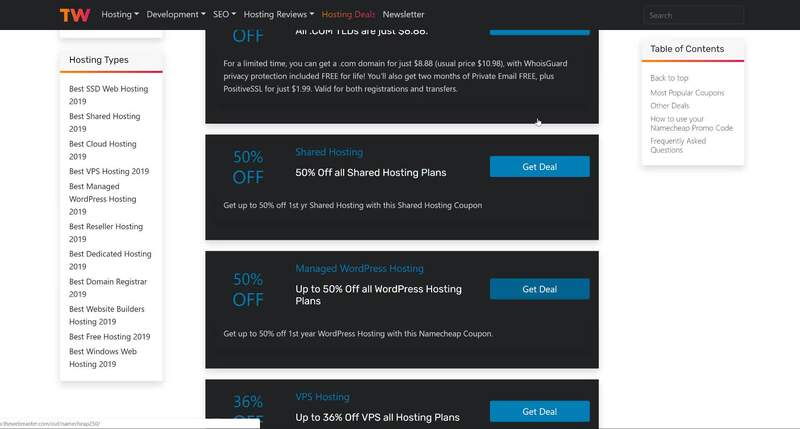 Get up to 50% off 1st year WordPress Hosting with this Namecheap Coupon. This VPS Promo Code gives Up to 36% off (23% on cheapest plan) Virtual Private Server Hosting first invoice. You can save more if you sign up for a longer period. This is our Discount Coupon code which gives 40% off Reseller Hosting. The offer applies to the first invoice, so sign up for longer for greater savings. This is our Coupon which gives up to 50% off Dedicated Hosting yealy plans. The offer applies to the first invoice, so sign up for longer for greater savings. This Namecheap promo code gives you 46% off EV SSL (Green bar). 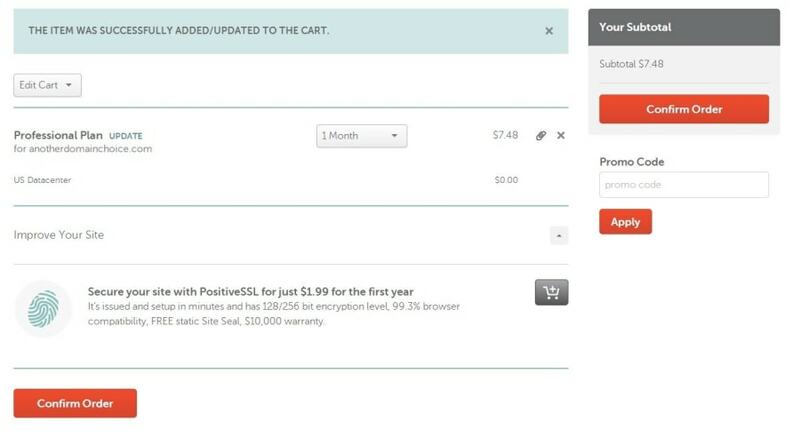 Price shown is for one year for a single EV SSL, however EV Multidomain SSL is available. This promotion gives you a Free WhoIs Privacy for one year with all web hosting plans. Usually $2.88 per year. To try out any email package FREE for 2 months, simply select "2 months" billing cycle from the drop-down. There is a mixture of discount codes and deals with direct links. If you select one requiring a promotion code, a pop-up box will display it for you to copy. Click add to cart for your chosen plan. The next stage is to enter your domain information. Here, you can register a new domain, or transfer an existing domain to use with your hosting services. You can only use one coupon at a time, so if you wish to get a discount on hosting, and do a domain name registration, then you will need to do it in two transactions. Any coupon code applies to the first invoice term. Paying for longer will provide better savings in the long-term. You should right-click in the Coupon box, and select paste (clicking the coupon earlier copied the code to your clipboard). You may be required to register a free account prior to using the coupon. Enter your Discount Code, and proceed to checkout © The Webmaster. You will need to either log into your account or create an account before you can arrange payment for your services. If you have already created an account, then you should already be logged in, and you will go directly to the payment screen. It was voted the Best Domain Registrar by Lifehacker readers in 2012. They are involved in fighting against CISPA, a bill that would allow the US Government unrestricted access to all their user data. Also, they took an active anti-SOPA stance back in 2012 when GoDaddy stupidly came out in support of it. They are one of the few hosting providers that accept Bitcoin. The company is a big supporter of the Electronic Frontier Foundation, with their Move Your Domain Days where they offer significant savings when grabbing a Namecheap transfer coupon. They work with website Awesomebabyname.com, which helps parents choose the name of their children based on Domain Name availability. As you can see, they are not afraid to stand up for your rights, take on the Government, and even support “good causes”. Are there any Namecheap Renewal Coupon Codes? No, unfortunately not. You can always create a new hosting account at the discounted price, and move your website across. For domain renewals you will need to pay the full price, or transfer to another registrar to take advantage of introductory pricing. You should add $0.18 ICANN Fee to all prices. No. All web hosting plans, except the Stellar Business SSD Plan, must be paid for on a yearly billing term. 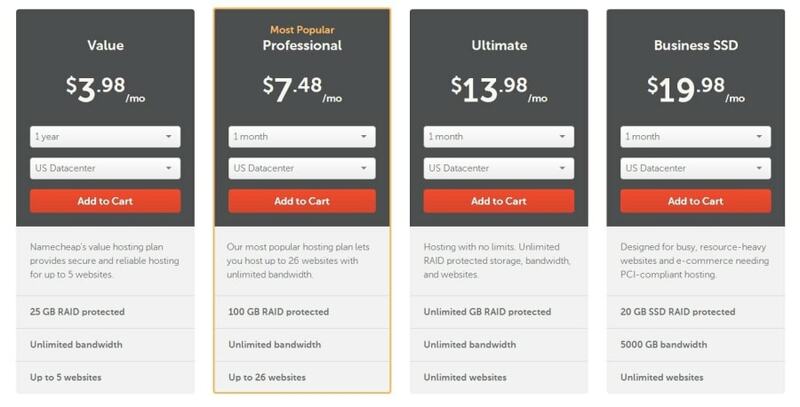 Payment is limited to yearly billing terms on all shared hosting plans, with the exception of their Stellar Business SSD Plan, which you can pay monthly, six-monthly and yearly. Yes, they offer a free “.website” domain. They accept the following methods: PayPal, Google Checkout, Visa, MasterCard, Bitcoin, and American Express. For US residents, they also accept Dwolla. They do offer Bitcoin hosting. They offer a 14-day money-back guarantee for shared and VPS hosting. Yes, any introductory rates or discounts obtained using a Namecheap offers only apply to the first invoice. Subsequent invoices will be at the higher standard rate. Can I use a credit card to set up auto-renewal? Yes, you can choose whether to implement automatic renewals or not from within your client area. Do they provide Google Adwords credit with sign ups? They do not offer free Adwords credit at the current time.